The balsamic vinaigrette dressing provides both provides flavour and added moistness to this simple, yet versatile, meatball recipe. Mix meat, yellow onions, bread crumbs, egg and 1/4 cup dressing just until blended; shape into 8 (3-inch) meatballs. Place on foil-covered rimmed baking sheet. Bake 26 to 28 min. or until done (160ºF). Meanwhile, heat 1 Tbsp. dressing in large skillet on medium heat. Add peppers and red onions; cook 5 to 10 min. or until onions begin to caramelize and peppers are tender, stirring occasionally. 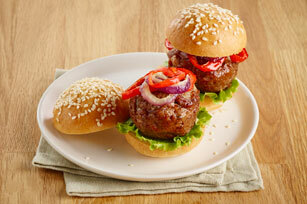 Place meatballs on bottom halves of buns; top with vegetable mixture and remaining dressing. Cover with tops of buns. For a touch of green, add lettuce to the sliders.